Home» AP Employee Transfer and postings Guidelines/ Instructions | AP Employees Transfers and Postings Guidelines / Instructions | AP GO's | AP Inter Subordinate Service Rules Information | AP LATEST UPDATES | AP LAWCET 2016/PGLCET Results Download » AP General Transfers for Intermediate Education Employee Transfer guidelines as per G.O.NO:130. AP General Transfers for Intermediate Education Employee Transfer guidelines as per G.O.NO:130. Andhra Pradesh AP Intermediate Education Employee General Transfers-2016 guidelines as per G.O.NO:130 , AP General Transfers for Intermediate Education Employee Transfer guidelines as per G.O.NO:130 , AP Inter Mediate Education Employees General Transfers 2016 Guide lines as per G.O.NO:130 , AP G.O.NO:130 Employees of Inter Mediate Education General Transfers 2016 Guide lines as per G.O.NO:130. AP Public Services – Intermediate Education – General Transfers, 2016 – Transfer guidelines for the employees working in the Department of Intermediate Education – Orders – Issued. Representation of General Secretary, Govt.Jr.Lecturers’Association, Amaravathi, A.P., dated:Nil. From the Commissioner of Intermediate Education, A.P.,Hyderabad Lr.Rc.No.Ser.II-2/925/2016, Dated:13-06-2016.
relaxing of ban on general transfers, 2016 of Government employees in the State. 2.In the reference 3rd read above, the Commissioner of Intermediate Education, A.P., Hyderabad has suggested certain guidelines on General Transfers, 2016. 3.Government have examined the matter and decided to issue the guidelines on general transfers, 2016 which are appended to this order as Annexure. The Commissioner of Intermediate Education, A.P., Hyderabad is hereby permitted to effect the transfers of employees of Intermediate Education Department and completed the same before 30-6-2016 as per the guidelines through counselling duly drawing the Schedule of transfers. take necessary action in the matter accordingly. 5.This order issues with the concurrence of Finance (HR.I.Plg.Policy) Department vide their U.O.No.98385/42/A2/HR.I/2016, dated 25-6-2016. (a)This is applicable to Employees working in Department of Intermediate Education. 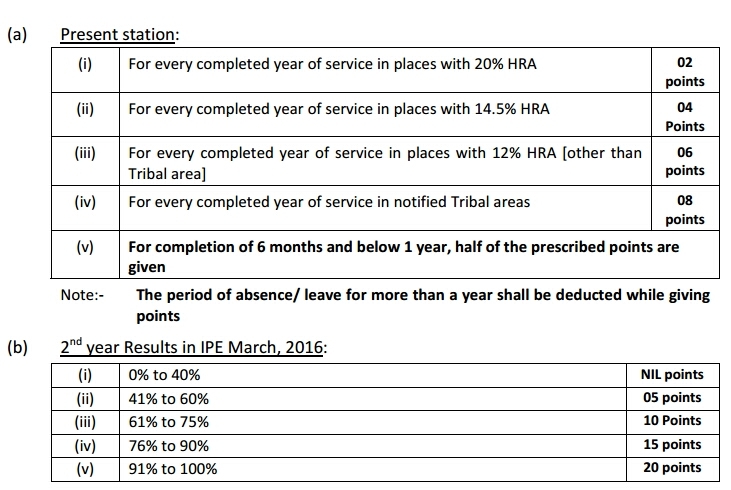 The employees who completed 5 years of service at station as on 01.06.2016 are liable fortransfer. The Employees (Minimum Time Scale holders) who completed 2 years of service at station as on 01.06.2016 are eligible to apply request transfer in a clear vacancy. Commissioner of Intermediate Education shall draw schedule for effecting transfers. The appointing authorities concerned i.e., RJDIE’s in respect of Junior Lecturers, Physical Directors, Librarians and Non-Teaching Staff and the Commissioner in respect of Principals & Dy. D.V.E.O./A.O. shall issue transfer orders based on the recommendations of the Committees constituted for the purpose and based on the counseling. 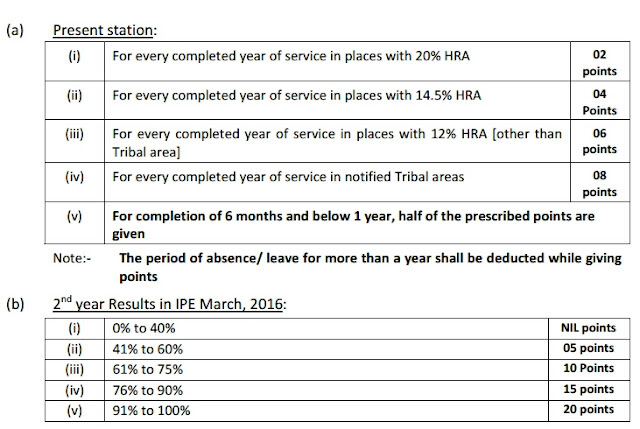 (1)No person shall be transferred before completion of 2 (Two) years of service in a particular station as on 01.06.2016. (2)No person shall be retained beyond 05 years of stay as on 01.06.2016. 2016 that posts shall be shown vacancy. (c)Women employee shall be posted to Women’s Institution to the extent possible. vacancy. The Junior Lecturer in Urdu Medium may be retained in a same place when nobody opted to that place. NCC units exist as far as possible. College. Only after that such JL will get himself relieved and join at his new station. Corporation during transfers by counseling. It is to ensure that candidates do not remain long in a particular station. Station means place (City/ Town/Village where he/she is working) of actual working for the purpose of transfers and not office or institution. (2)Principals can however, be posted within the native Districts. zone will be given the first choice and so on. complaint of non-adherence to guidelines. (2)All employees shall join at the new place of posting after the orders are issued. fact clearly against the name of that employee if there is any request for transfer. same may be relaxed in case no eligible candidates are available. (2)The places with 20% HRA will be considered as Focal and others will be considered as Non-Focal. (a)The number of employees to be transferred shall not exceed 20% ceiling. will not be taken as vacancies. Circular Memo.No.245/Sw/A1/2014-1, G.A. (SW) Dept., Dt. 16-9-2014 and also Circular Memo.No.17225/SW/A1/2014-1 of G.A. (SW) Dept., Dt. 27-9-2014 willapply. The Government Junior Lecturers Association Andhra Pradesh and A.P.Non-Gazetted Officers Association are only the recognized employees associations pertaining to this Department. particularly in the Agency and Remote areas where there is shortage of teaching staff. In some areas, except the Principal there is no other regularJunior Lecturer available. The academic and administrative work in those colleges is seriously affected. It is, therefore, necessary to maintain a minimumof regular staff of Principal/J.L. /P.D./ Librarian. The entitlement points as following shall be awarded to the candidates liable for transfer and eligible for transfer. (i)In case of Principals, the College performance will be taken as criteria. (ii)Where more than one Junior Lecturer exist in a College, the number of students appeared, passed and percentages shall be ascertained through a certificate of the Principal showing all persons in the subject. The Principal concerned will be held responsible for the correctness of the Certificate. 3.Persons who suffered with serious accidents within the last one year and are partially disabled/ incapacitated. (a)Not to insist on the transfer of visually challenged employees and teachers from their present place if they find it more assessable and easy to commute on daily basis. (b)Consider the visually-challenged Employees/ Teachers in category (A) while providing a choice for transfers, giving them an ample opportunity to choose a place of their preference depending on their convenience for travel and other basic facilities necessary for their dignified movement and the mundane survival. R.J.D. duly certified by the Principal concerned for approval of the same by the R.J.D. (b)If any employee fails to submit the same, the entitlement points may be prepared at RJD level to the extent of available information and any discrepancy due to lack of information, the employee only will be held liable. available left over vacancy by the concerned transferring authority. (a)The list of employees who are liable for transfer and request application by candidate eligible for transfer with entitlement points shall be displayed at Office of the R.J.D.I.E. and O/o. the D.V.E.O. information will attract severe disciplinary action. will be produced for scrutiny whenever required at Regional Joint Director level. The lists of employees liable for transfers are to be prepared in descending order as per entitlement points accrued to them. Such lists shall be displayed on the notice board at the Counseling camp. The applicants will be called in the descending order of entitlement points and may choose any of the vacant points available at that point of time. The option has to be exercised in writing and in case two or more applicants secure same number of entitlement points, preference shall be given to the employee who has put in longer service in the particular station. As per the Government instructions, the transferred employee is deemed to be relieved at the end of 07 days from the date of receipt of the orders. The Principals will relieve the candidates immediately irrespective of the request from the candidate for relief. They have to join at their new places within the joining time, subject to such conditions as may be prescribed by the Government. (a)The Government may either suo-moto or on an application received from any person aggrieved by the orders of the “Transfers Committee” may call for and examine the records in respect of any proceedings of transfers to satisfy himself about the regularity, legality or propriety. If, in any case, it appears to him that any such proceedings need to be modified, annulled or reversed or remitted for reconsideration, he may pass orders accordingly so as to rectify any violation of rules or discrepancies. Such order shall be implemented by the authority concerned. (b)The Commissioner may stay the implementation of any such proceedings pending exercise of his powers under Sub-Rule (a) above in case of need either suo-moto or on a complaint. Commissioner of Intermediate Education from time to time in the matter shall be liable for disciplinary action as per rules.